Professional 7600 Square foot Shop with an attached 4 Bedroom 2.5 Bath Apartment. 6'' reinforced concrete slab. This is a Varco Pruden Building built by Super Structures. In-Floor Radiant heat with natural gas. Commercial Engineered Septic.-Septic system was designed and engineered for 8,000 gallons per day use. -6ft high Chain link fenced area of 130ft x 220ft offers secure outdoor storage or parking. 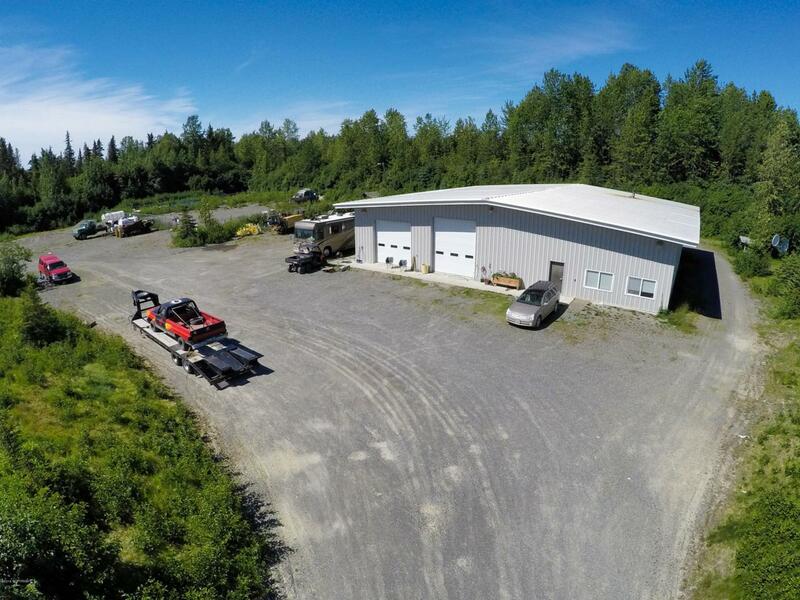 -The building in total is 80ft x 80ft -The Shop area is 60ft wide x 80ft deep -Middle overhead bay door front & back is 12ft wide x 16ft high -Western side overhead bay door in front is 12ft wide x 14ft high -Front office is 20ft x 20ft -Apartment downstairs takes up 40ft deep x 20ft wide -Apartment upstairs takes up 20ft x 20ft for 2 bedrooms and then an additional area of 20ft x 20ft that is just above the office, that is used as a storage area with only a ceiling height of 5.5ft -Downstairs, The rear 20ft x 20ft area behind the apartment is utilized as a maintenance room. -Upstairs, in the rear behind the apartment, there is an area of 40ft deep x 20ft wide that consists of two rooms, a mechanical room & a conference room that is accessed by a stairway from the main shop area. -Garage doors are on automatic openers which are setup and included. -Shop floor has been sealed with a nice layer of Epoxy. -Large parking areas around the building offering you the perfect shop for large equipment & semi truck use. -Office Ceiling height is 10ft -Shop Ceiling height ranges from 16ft up to 20ft towards the middle area. -Apartment Ceiling height is 8ft -Building is insulated with high density rigid foam and has finished walls using enameled metal cladding and sheetrock. -Owner reported R-21 insulation was used on the walls and R-24 insulation in the roof. -Workshop area and benches located on the northwest corner of the shop. -Building is heated using a European make boiler for the hot water radiant in-floor heat on the concrete slab. -There is 3 Phase Electrical installed and wired into the building and the entire building is wired in conduit with extensive convenience outlets. -Near the Middle Bay Door in front, there are 2 railroad tracks bedded into the concrete slab to allow heavy equipment to be moved in and out of the building, preventing damage to the floor. -Office is finished out and has a suspended acoustical ceiling. There is an adjacent bathroom for the office to use. -Apartment is accessed from the office or maintenance room in the rear which is accessed through the shop. This building would be perfect for any company that requires the use of heavy equipment or semi trucks. This property would also be perfect for a boat repair shop, retail use or mechanics shop. The possibilities are endless with this property! Owner Financing Available! Listing Office Coastal Realty. Copyright 2019 Alaska Multiple Listing Service, Inc. All rights reserved.